I could listen to my long-time teacher Rabbanit Esther Levanon giving classes from sunrise to sunset, and I don’t think I would ever get bored of her practical, advice and anecdote-filled lectures for mothers and wives and Jewish women. And in Rabbanit Levanon’s classes, the ultimate source of authority (after Hashem) is Eema, Rabbanit Levanon’s mother– Rabbanit Borstein. Over the past year, though, Rabbanit Levanon has been mentioning Eema in a different context as well. 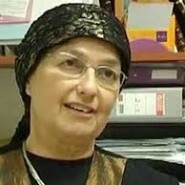 When women approach her after her lectures with personal questions, and ask if they can call her at home or set up an appointment with her for a consultation, Rabbanit Levanon explains with a firm smile that she is no longer able to meet with women because when she is at home, she is “taking care of Eema,” who moved into her home over a year ago. Therefore, nowadays, she is only able to speak privately with women during her commutes from her home in Elon Moreh. Until last night, when I attended a wedding of friends who are marrying off their oldest son, and was very surprised to run into Rabbanit Levanon there. It turns out, the Rabbanit explained to me, that the father of the bride is her twin brother. So last night, I finally merited to meet the famous “Eema,” the proud grandmother of the bride. Eema, it turns out, is an impressive looking, Yiddish-speaking, wheelchair-bound woman in her late 80s or 90s. Rabbanit Levanon and her daughters-in-law did not leave Eema’s side for the entire wedding. When Rabbanit Levanon passed by me while searching for a cup of water for Eema during the chuppah, I whispered to her that it was such an honor for me to finally meet her mother after all of these years of hearing about Eema in the Rabbanit’s classes and Rabbanit Levanon patted my shoulder and shot me a heartfelt, thankful smile. In my eyes, Rabbanit Levanon’s devotion to her elderly mother is nothing short of extraordinary. And for me, and for all of us, I think it’s also an important reminder. No matter how much we love our moms and our dads, the relationship between married daughters and our parents is inevitably complicated. With highs as well as plateaus and some prickly low points too. And I think for me, in my interactions with my own parents, I would like to keep the image of Rabbanit Levanon caring for her “Eema” at the wedding last night in my mind’s eye. A woman who, despite the inevitable plateaus and prickly low points, manages to observe the mitzvah of “Honor your father and mother,” l’mehadrin.